Reality Tv Star Khloe Kardashian Has Been Accused Of Banning Lamar Odom's Father From Seeing The Retired Athlete As He Recovers In Hospital. The Keeping Up With the Kardashians star has been by her estranged husband's beside since he was hospitalised earlier in October (15) after being found unconscious in a Las Vegas brothel. 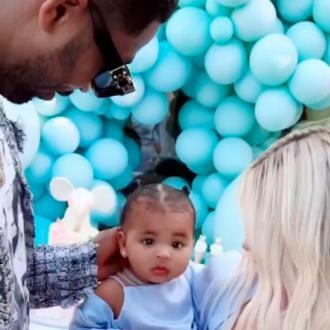 Lamar remains in a serious condition and is facing a long road to recovery, and Khloe called off their divorce proceedings to focus on his health. She has now been accused by Lamar's father Joe of preventing him from visiting his son since he was transferred to the Cedars-Sinai Medical Center in Los Angeles last week (ends25Oct15). "I'm mad, I'm upset because this is the second time I came to see my son and they won't let me see my son," Joe tells TMZ.com. "It's a lotta (sic) sabotage, things going on, like why can't I see my son? I brung (brought) him in the world. I'm highly upset right now, this is the second time... they won't let me see my son like I'm a villain or something man, that's my son. "They (are) saying I'm not on the visiting list. I called... his organisation and they told me I was on the visiting list today. They told me that yesterday and today. They shut it down with 'He didn't want to have no (any) visitors', stuff like that. They let other people see my son that is (are) not even related to him!" When asked who he believed was responsible for the list, he replies, "Khloe Kardashian... I don't know (why). When I was in Vegas I saw my son every day... I have no problems seeing my son... I've tried reaching out to everybody. That's why I'm here now. It's p**sing me off." Joe, who claims he hasn't been able to see Lamar for four days, has a tumultuous relationship with his son and previously spoke out against Khloe after she filed for divorce in 2013.